Facebook wants to know what’s on my mind. Actually, that’s not true; so far, it wants to know only what’s on some of my friends’ minds. Facebook doesn’t care about me yet, although it promises that will soon change. This new status-update field sounds like a self-conscious Carrie Bradshaw type who asks her boyfriend what he’s thinking every time he’s silent for more than five minutes. “I don’t even know how to fill it in,” Katie Tichacek says of the revised update box. An active Facebook user, Tichacek describes herself as “totally a status person  I like a quick and dirty read-through of what people are doing.” Until yesterday, she was changing her status regularly with updates about what she was eating, reading or working on or where she was traveling  but with the new home page, she’s having an existential crisis about telling Facebook what’s on her mind. Why is Facebook’s news feed becoming so introspective “It’s going to be more about the message you want to send to others than what you’re doing at that very moment,” says Meredith Chin, Facebook’s manager of corporate communications. Or as the company described it in a blog post: “One way to think about this is as a timeline  or a stream. As people share more … the pace of updates accelerates.” Sort of like those annoying tickers that run across the bottom of cable news channels, but all the news is about people who never get off their couches. If people are honest about their status updates, Facebook news feeds will become either a series of one-word thoughts or uncomfortably intimate revelations: Your prom date needs to drop a few pounds. Your co-worker is starved for affection. And your best friend wants a taco. I liked it better when we were all just hungry. 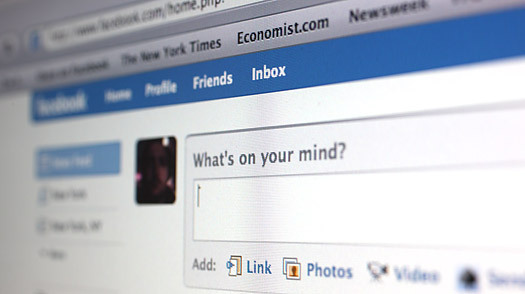 Read about Facebook’s about-face on privacy.